Andrew was born and raised in Louisville. He attended the University of North Carolina on a Morehead-Cain scholarship, where he earned a Bachelor’s of Science in Business Administration. He then returned to Louisville and worked part-time at a construction company while attending U of L Brandeis School of Law. He graduated from law school in December 2013. 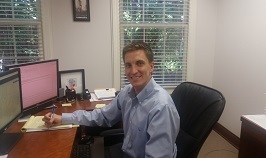 Andrew focuses his practice on commercial real estate and business law. He is licensed to practice in Kentucky. In his free time, Andrew enjoys spending time with his wife, Ashley, and their dog, Caesar, reading, playing sports, and cheering on the Louisville Cardinals.